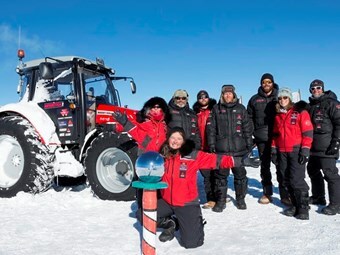 After a gruelling 2500km journey on ice and snow, the Massey Ferguson Antarctica2 expedition team has finally arrived at the South Pole on its MF 5610 tractor in high spirits. After 17 days of driving in a Massey Ferguson MF 5610 tractor on ice and snow, the Antarctica2 expedition team has finally arrived in the South Pole. On December 9, the crew announced: "After 17 days and 2500 kilometres, we are at a red and white striped pole with a reflective ball on top, surrounded by flags. This is South 90 – as far South as anybody can go. "We’re all ecstatic to be here and so proud to be taking our hero shots with the tractor that never gave us cause to doubt that it would be up for the challenge. Thank you all for your support." The ambitious team set off on the 5000km round trip mission on November 22 after three years of meticulous planning, led by Dutch explorer Manon Ossevoort, also known as ‘Tractor Girl’. The expedition aims to emulate famed explorer Sir Edmund Hillary’s historic journey to the South Pole 56 years ago with a fleet of Ferguson TE20 tractors. For Ossevoort who has always wanted to drive a tractor to the ‘end of the world’, the successful feat was a dream come true. "It’s such a beautiful feeling and I’m so grateful to Massey Ferguson to have made this possible. It’s such a huge dream come true," she says as she hugged the tractor with joy. "To have dreams is beautiful but to see them realised is the most extraordinary feeling. I’m inspired." The 38-year-old actress and theatre-maker has driven a tractor 38,000 km from her home in the Netherlands across Europe and Africa in the past. One of Ossevoort’s first tasks upon reaching the Pole is to build a snowman and symbolically entrust it with the dreams of everyone who have been caught up in her story. "I want people to believe in the power of their dreams – to know that with grit and determination, you can achieve your aspirations," she says. "I had the seemingly impossible dream to drive a tractor to the South Pole. You just have to believe in it." The arduous journey took 17 days of driving. With the Antarctic’s constant daylight at this time of year, the team created their own 30-hour days, driving the MF 5610 for 23 hours or more at a stretch, pausing only briefly for routine maintenance and driver changeover before pushing on. The tractor engine has been running non-stop since the expedition departed. Along the way, the team had to tackle treacherous crevasse fields, steep climbs, punishing sastrugi (solid ice-waves as high as one metre) and deep, soft snow. Crossing the Gabienz Mountains at 3400m altitude, temperatures plummeted to minus 56 degrees celsius with wind chill. At one point a massive solar storm blacked out communications. However, both man and machine overcame the multitude of challenges, proving their resilience in this extreme environment. Massey Ferguson Europe, Africa and Middle East vice-president and managing director Richard Markwell congratulated the team on its tremendous achievement. "It’s an immensely proud moment for Massey Ferguson and everyone associated with our farm machinery," he says. "As a great example of Massey Ferguson’s straightforward dependability, our tractor had a job to do and delivered on all fronts. Manon’s challenge to us to accompany her on her expedition was one which we were willing to accept and always confident to win. "As such, Antarctica2 is a reminder to a global audience of the challenges facing a new generation of farmers and of the rugged, reliable equipment they need to meet the world’s growing demand for food." After a day’s rest at the South Pole, the Antarctica2 team will pack up, turn around and embark on their journey home on the same route back to Novo Runway on the Antarctic coast. With luck, they could be back before Christmas. Ossevoort is joined by polar explorers Matty McNair (Expedition Lead Guide ), Sarah McNair-Landry (Expedition Guide and Audio-Visual Support), Nicolas Bachelet (Lead Mechanic) and Simon Foster (Creative Director and Audio-Visual Lead) on the expedition. Find Massey Ferguson tractors for sale. Look up Massey Ferguson tractor specifications.